I couldn’t go to Paris and not visit the Louvre. Husband and I agreed though that with a three year old in tow, visiting a vast collection of artistic masterpieces seemed to signify potential disaster and meltdown on an epic scale. Thus we decided to go our separate ways – Husband and Son to the park, me to the Louvre. Time was at a premium, so tough choices were needed. I picked a number of must-see masterpieces – obviously including the Mona Lisa and Venus de Milo, then planned my visit with military precision. There are more than 400,000 works of art here, of which 35,000 are on permanent display, so even if you have the luxury of time, planning still needs to be done. It is an immense place – you could probably spend a week inside and still miss something. I arrived early – there were crowds, but less intense than later in the day. The galleries are well designed and colour coded so it is easy to find your way around. As always, the Mona Lisa had a huge mass of people elbowing to get near – 2,000 visitors per hour descend on this painting, so she is a popular lady. Once again I was blown away by the size – so tiny, this never ceases to amaze me. I enjoyed the next couple of hours, strolling at leisure through the galleries, ticking off my must-sees. I met up with Husband and Son after lunch and we spent time strolling around the outside of the Louvre. It is a beautiful building even if you never go inside. Stretching for half a mile along the Seine, it began as a medieval fortress, was expanded over the centuries into a luxurious royal residence and designated a museum immediately after the revolution. 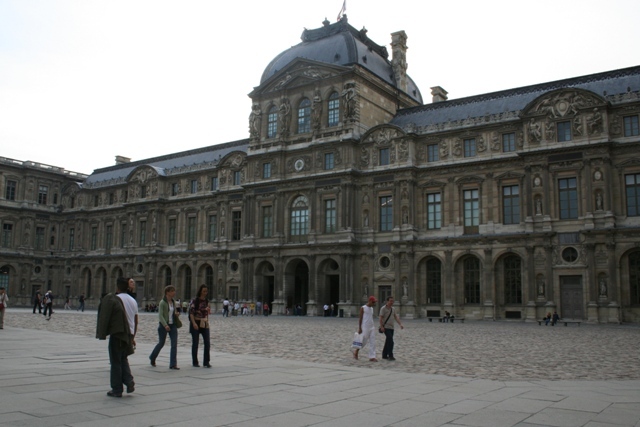 Its collection was significantly expanded by Napoleon. Son was pretty taken with the pyramids at the entrance. I have to confess, I feel the same way. 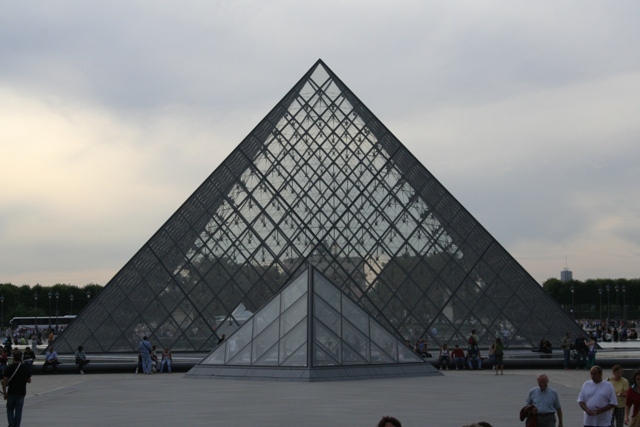 They were built in the 1980’s and designed by IM Pei – the big one is 67 feet and super impressive. Son wanted to take the escalator down to the entrance foyer below ground level – this became an endless source of fascination for him – still at least he can say he has been in the Louvre. An endless source of fascination for me was the never ending wave of people visiting. We strolled through a series of immense courtyards, just taking in the beautiful architecture and surroundings. A lady was singing opera in an archway – surreal and wonderful. The fountains also provided some entertainment and fun for our youngest family member. A lovely morning and a great end to our trip to Paris. I too was struck by the small scale of the Mona Lisa when I visited the Louvre. But, on the other end if the scale, I had not expected the Botticellis to be so huge. I was last in Paris when my oldest was 4 months old so I wandered around the Louvre breastfeeding. I think your solo tour sounds more relaxing and comfortable. It was definitely easier flying solo on this visit! Some things are more fun with kids, however here I got time to look and wander so it was a lot more relaxing! I love your style of writing. ‘Meltdown of epic proportions’ took me back to the days of young children. Yes definitely want to avoid that. 🙂 looks like a wonderful trip. Thank you! Yes it was a really fantastic holiday. Sometimes it’s a good idea to split up for a bit. Glad you got the artistic end of the straw on this occasion. Yes, I normally get the irate/grumpy kid end so this was a nice change! We mostly shy away from them too – I made an exception for myself this time, but we all had such a lovely day afterwards exploring outside, something I’ve never experienced at the Louvre before. I hope to visit the louvre someday. I think I may leave z with a babysitter though so I could really take my time! Definitely a good idea! It so would not have been our Son’s ideal day out, cue disaster for us as well! Getting a babysitter would be perfect. 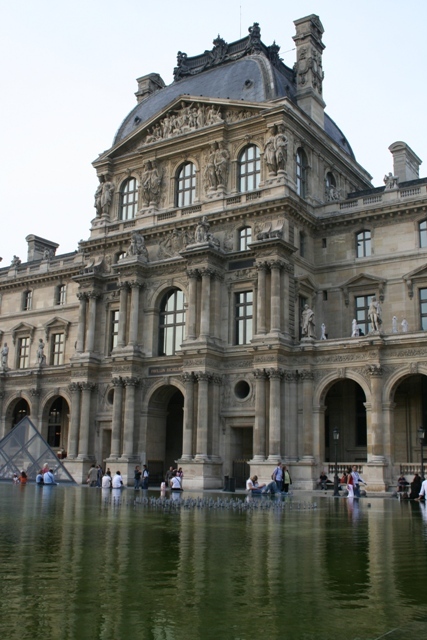 I love Louvre museum! When I first visited it in 2000, it was such a grand museum to me and I am sure it is still one grand thing. Mona Lisa was almost the first to run to for most visitors it seemed as the museum is so big and plenty to see. 2000 per hour sounds ridiculous number of visitors. Nothing beats seeing the real thing. Love the Louvre. Though I tend to stick to the ancient Egypt and Greece section. Have you gone to the Musée Carnavalet? And the Musée de Cluny? No we haven’t Brian, but thank you for the suggestions, they will go on “the list” for our next Paris trip! 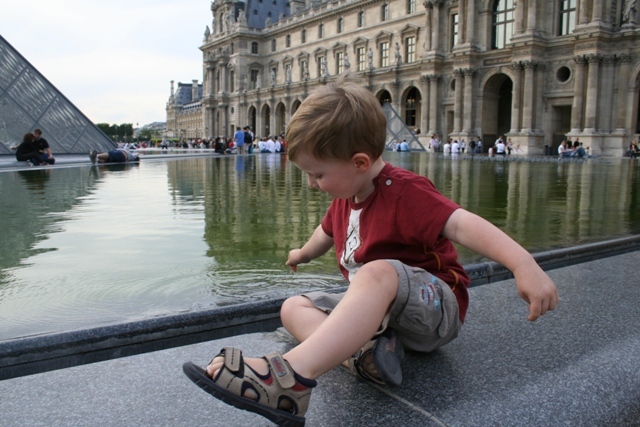 We found so much in Paris for a 3 year old – saw the city with new eyes for sure! Hope your trip goes well.